We gave this important article a bit of a shake up, removing a few pairs that had fallen out of production and replaced them with three new sets of brilliant budget phones. The new additions were three closed-back designs – the Behringer HPS3000, the OneOdio Studio Pro-10, and the Panasonic RP-HT161-K – along with an awesome pair of semi-closed back Samson SR850. Are $50 Studio Headphones Even Worth It? Won’t Cheap Headphones Break Easily? How Transparent Are Affordable Studio Headphones? While most professional producers insist that you can’t monitor a mix on anything cheaper than a $200 set of headphones, not everyone can afford to spend that much. 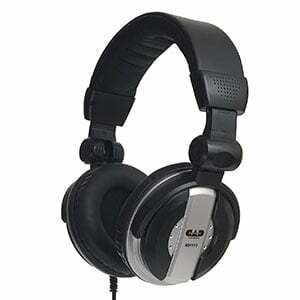 Today we are going to take a look at some of the best studio headphones which can be yours for less than $50. This is about as cheap as it gets for what is essentially a niche class of headphones. As we are about to see, there are some solid solutions in this segment of the market. Let’s go over our top picks and then we’ll go deeper into affordable studio headphones. Entry level model of an iconic series, bringing you already proven performance. Semi-open-back studio headphones with awesome clarity. By far one of the most impressive headphones in the affordable segment. Innovative affordable headphones with a surprising sound. A stylish pair of German-designed budget headphones. Most affordable set of headphones that still offers decent transparency and comfort. The dictionary definition of ‘bargain’ right here! 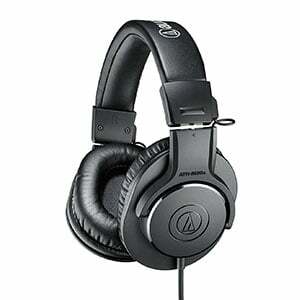 Audio Technica's line of studio headphones has been an instant success from the moment it hit the markets. It didn't take long for users to figure out the impressive value Audio Technica offered at a much more affordable price range. The cheapest and model from that lineup is the ATH-M20x. These headphones pack a set of great 40mm drivers and a fairly solid build. While the materials aren't the best, Audio Technica made sure to offer plenty of padding where it is needed the most. At the end of the day, what we got was a set of headphones that didn't cost much, offered great performance for the money, as well as decent user comfort. That's impressive for budget headphones. Pushing for the top spot in this chart is this pair of SR850 from Samson, which feature a stylish all-black design, with semi-open-back ear cups, velour pads and a self-adjustable headband. Due to the semi-open-back design, these are less versatile for anything other than home or studio use, but the trade-off is worth it for natural sound replication, and – while not particularly bassy – great clarity in the mids and trebles. In fact, it’s easy to forget that this is a very wallet-friendly pair of phones! Be sure to read the full review for more on the Samson SR850. The amount of turmoil caused by Superlux and their headphones has really made an impact on the budget segment of the market. When they first appeared, a new standard was set which forced everyone else to catch up. Superlux HD681 EVO are still one of the best bargains in town. This set offers great performance out of the box, with an upgrade that is easily attainable for free. Their design is great as well as their build quality. On top of that, Superlux implemented some solutions which aren't seen in this market segment. The sole fact that you get a detachable cable makes them so many times more versatile than their competition. Overall, HD681 EVO is definitely worth checking out. While one of the lesser-known brands on this list, the Studio Pro-10s from OneOdio have really impressed in this budget market, thanks to innovative design and a terrific sound quality. While not high-end, is it still a very stylish matte black pair, with chrome and red detailing. 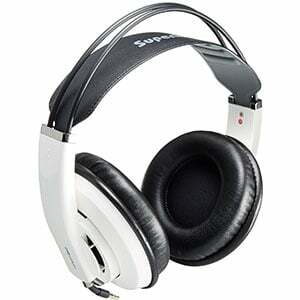 The ear cups are padded and quite comfortable, although circular and a bit snug – which may turn off some users. However, the sound on offer is excellent, with ample bass and clear highs. For a closer look at this popular budget pair, you can check out the full review of the Studio Pro-10s. Behringer is a familiar face in the high-end audio market, but this set of HPS3000 studio headphones are anything but. They come in at well-under $50, but still show off impressive design and performance. With a mix of silver plastic and black padding, this is a stylish pair of budget phones, with a lightweight design that makes them comfortable to wear for prolonged periods. In terms of performance they offer fantastic sound quality for the price..
Other features include a single-sided oxygen-free copper cable and a 1/4” TRS adapter. For more on the Behringer HPS3000 be sure to read our full review. CAD is one of those brands that is well known for their more affordable solutions. MH110 is about as affordable as you would want to get with studio headphones. The only question is, do they actually work? What CAD has done right with MH110, is to focus on hardware and performance over aesthetics. They have still kept the necessary levels of build quality, but MH110 isn't much to look at. That becomes irrelevant once you hear those two 50mm drivers cranking some serious volume. Overall frequency response is decent but requires some work if you want proper transparency. A bit of equalization can make all the difference with CAD MH110. While an inconvenience for sure, some tuning is absolutely recommended. From a trustworthy brand comes the RP-HT161-K, which is the cheapest pair of headphones on this already budget-friendly list. For the price of a large pizza, this closed-back pair offers a simple but stylish design, with a matte black plastic headband, two comfortable plush-padded earpads and a 2-meter cord. Ultimately there’s nothing extraordinary in the build, but overall very solid. As is the performance – with two 30mm neodymium drivers, this pair offers a decent sound, with good balance across the registers. All in all, an absolute bargain! There’s more on this pair of RP-HT161-K from Panasonic in the full review. No matter what you’re told, the short answer is yes. We would all like to have expensive gear right off the bat, however that is something only a handful of beginner producers can afford. In a way, starting with lesser quality equipment is actually a good thing. Chances are you would have a hard time noticing the difference between cheap and the best studio headphones on the market. Your ears need time to adapt to this type of equipment, especially if the only thing you have used until then were standard consumer grade headphones. Even the models we are looking at today are better than using regular headphones. The reason being that every pair of consumer headphones is biased. Most of them express this bias in the lower end. Modern music is full of bass, so brands tune the transducers to offer rich lows with little regard to trebles and mids. Studio headphones aim to offer flat response across the range. That is something even the $50 studio headphones can offer to a certain extent. Once you get used to the idea of monitoring headphones, you will likely appreciate the performance of $500 models much more. Here’s the deal. It is no secret that lower prices usually mean lower quality materials. Manufacturers can only cut the price of a product in so many ways. With that said, as long as you treat the headphones right, you should really run into any issues. The models listed above all have a great track record in terms of build quality, meaning that your chances of getting a lemon are super slim. The only component you need to worry about is the cable. Since most of the models in this segment of the market come with a fixed cable, and not a very sturdy one, you should try to avoid twisting it. The main issue with headphones that have a fixed cable occur when that cable breaks or stops working. Replacing it is not impossible, but it sure is a pain. Other than that, the biggest issue you will ever have to deal with in terms of build quality, is probably going to be that feel of cheap vinyl and plastics. Considering how affordable these headphones are, that is a small price to pay in the grand scheme of things. This is a very good question. Before we go any further, transparency isn’t the only metric that makes good studio headphones. There are other things that need to be considered as well. However, having a flat response is ultimately what it all comes down to. Affordable studio monitors offer a decent compromise. The response is going to be acceptable in most cases, which allows you to get the job done with enough insight into your mix. You probably won’t be able to hear every single subtle detail, but that’s perfectly fine. One thing you can do is even things out a bit using an equalizer. Most headphones these days come with a frequency response graph which tells you exactly where the dips or spikes in the response are. By boosting or cutting frequencies that stand out, you can increase the the performance a little. Naturally, equalizing the signal won’t solve the issue, but it will make the whole experience much better. To answer the question from the title of this paragraph, affordable headphones can be transparent enough. It all comes back to the fact that even bad studio headphones are better than regular consumer grade ones. As the price of headphones goes down, the number of features also tends to slim out. The very first thing you should look for in studio headphones of any kind, but especially cheap ones, is raw performance. Everything else comes second. Aesthetics and comfort are always going to be an issue, however some of the headphones can be upgraded using aftermarket parts. Your main concern should be transparency. When you have that covered, look into how the headphones are made. Is there enough padding? Are the ear pads removable, and if so, do they match any high end model? One little trick that many brands like to use is to make their cheaper models compatible with their higher end ones. By doing so, they allow the user to mod the headphones and boost comfort. One feature that is rarely seen on budget models in a detachable cable. There are brands out there who include this feature even with their cheap models, but they are rare. Having a detachable cable reduces the chances of you having to deal with cable failure. On top of that, it allows you to get the length of the cable that you need. After all, not all studios are the same nor does everyone like to be close to their workstation. 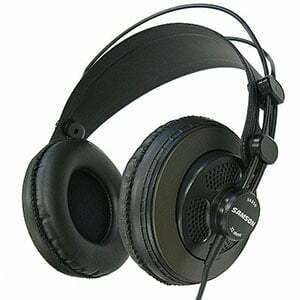 Affordable studio headphones are a powerful tool when you are limited by a tight budget. Long gone are the days when cheap automatically meant bad. These days, brands are racing against each other to design and launch a product that is better and cheaper than what their competition has to offer. The models we have highlighted in our chart are all great examples of good quality affordable studio headphones. Beginning a recording or mixing journey with any of these pairs will allow you to get into music production comfortably. They will also allow you to discover what you like and don’t like when it comes to studio headphones. You may want to upgrade in the near future, but at least these will get you started. Good luck!